I don't know if this is a regional thing, or a something that I picked up from the Western girls at college, but I've always referred to the 'heavens opening up and the angel choirs singing' moment after a big battle as the 'coming to Jesus moment.' Today, Connor had a coming to Jesus moment. Another five inches done today! I am finding out why people don't pull Cob manes...it's painful to pull and will be even more painful to put that thick, wavy hair into button braids. It all started when my trainer handed me a Dressage whip. This horse was trained to drive before he was ridden by a very well known Pennsylvania driving stable, so he's used to the whip. Or he should be. 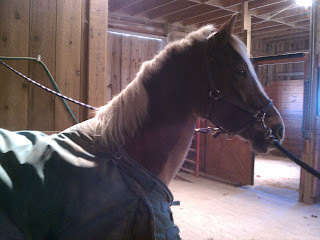 I touched him with it once, and from that moment, my previously quiet pony became a raging hellion. His mouth was hard, his head was up, his speed was stuck in the "Run away! Run as fast as you can!" position as he trotted right through my aids at a million miles an hour. My trainer only let this go on for a minute or so before she called me in and had me get off. She began a groundwork exercise that she described as "getting him between my leg and hand on the ground." She started with the hand, and used one hand as a leverage point and one as pull in order to ask him to give his head down. He was hard mouthed and resistant at first, but eventually got it. Next was the leg, which was simulated with the whip on his hind quarters. I have to admit, I didn't know what she was looking to achieve for a while as he pinwheeled around her in circles, reacting massively to every touch of the whip, but after a few minutes or so of this, he began to "get it". She wanted him to be lighter in the bridle and forward off of the whip, but not in a frightened, shooting-out sort of way, and she did eventually get him where she wanted him, which was giving his shoulder and jaw instead of using his shoulder to push her out of the way when she asked him to move off. I was all ready to write the lesson off as "just one of those green horse days," but my trainer's ground work completely changed him. He was still hot off the whip once or twice, but her strict instruction to shut him down immediately if he tried to squirt forward took care of that. Otherwise, he gave me some of the most elastic, forward trot we've had so far, again with that lovely contact from our last ride (a week ago! Ugh). The difference from the first half-hour to the last was just incredible, and part of it was the improvement in my riding. Again we worked on the idea of posting into the space between my hands, and I realized as I started carrying my outside hand further off of his neck that my too-narrow hands have been preventing me from creating the space I need in order to tell him where I want his shoulder to go. It seems so simple, but old habits die hard. I worked hard at keeping my elbows at my sides, and amazingly, as soon as my position was rock solid, his head dropped and he began swinging through his back more. No wonder people spend their whole lives working on this stuff! Hopefully there will be a Monday ride tomorrow! Jen, Mom and I wear Atlas gloves (thin rubber over fabric) when we pull manes. These gloves really save your fingers especially with the amount of mane we deal with. I love when cobs have temper tantrums. They normally result in really good movement. Thanks for following my blog! I read a couple of your posts and returned the favor. I'll definitely be back to read more about Connor--love your writing style, very clear and entertaining. I used to ride a Welsh cob/Clydesdale cross (can you tell she was an "oops"?) and she was such a sweetheart.